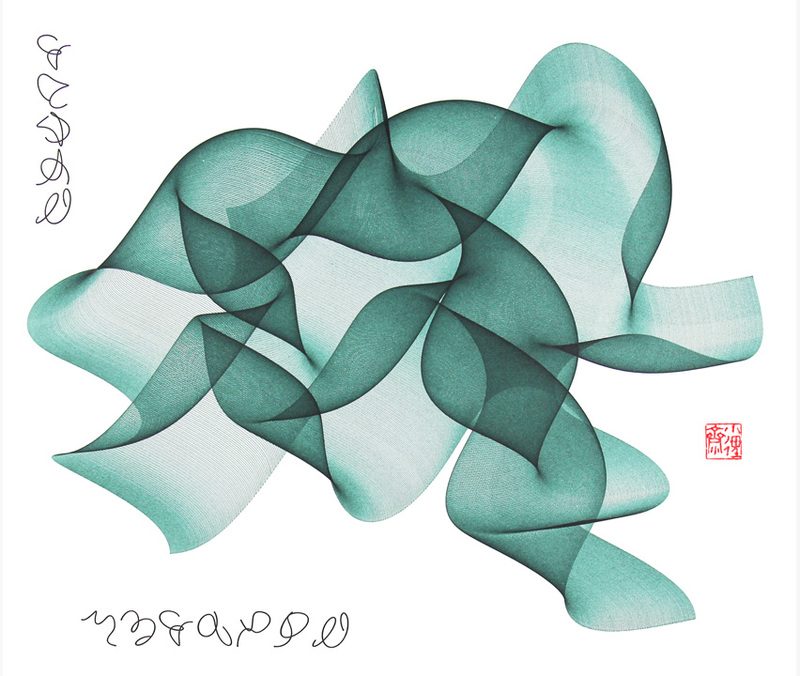 Algorithmic Art or Procedural Art or Generative Art is work that is created by following a set of rules or instructions or procedures. The idea of creating art in this way is old, but came to prominence in the 2nd half of the 20th century. Some artists, like Roman Verostko use computers to carry out their instructions, while others, like Sol LeWitt use people to carry out their instructions. These instructions could be expressed in lines of computer code, or in “natural language” sentences. Other examples of sets of instructions would be Sheet Music or a Cooking Recipe. These are also “procedures” to produce something. Let me write a simple procedure to generate Sound Art. Or at least “Sound.” Whether or not it is “Music” or “Art” I will leave to the eye, or in this case ear, of the beholder. 1. Make the softest, barely audible sound you possibly can. 2. Make your sound one small increment louder. 3. Repeat Step #2 until you cannot possibly make your sound any louder. Does my procedure generate “interesting” sound? It might generate both interesting and not-so-interesting sound depending on the choices and performative quality of the individuals performing my procedure. If all 130 Art110 students “performed” my procedure, some might be “Art” or “Interesting” and some might not. Some might be “Music” and some might not. Or you might choose to set those aesthetic “prejudices” aside and simply consider that all “results” or “works” that follow my procedure are members of the universe of possible results from my procedure. Although they’re much more elaborate than my procedure necessarily calls for, you could say that pieces like Bolero or Stairway to Heaven are “members” of the class of results of my procedure. I’m only writing this procedure in 2015 and I obviously wasn’t around in 1928 when Maurice Ravel wrote Bolero or in 1971 when Jimmy Page & Robert Plant wrote Stairway to Heaven. In this case, my procedure did not generate those works, but those works are still members of the class of results of my procedure. 1. Go to the 4th floor of the CSULB University Library. 2. Go to a bookcase on the 4th floor, pick the 4th book on the 4th shelf and write down the 4th word of its title. 3. If the book has fewer than 4 words in the title, use the last word. 4. Have you gone to all the bookcases on the 4th floor? If no, repeat step 2. If yes, go to step 5. As is, Glenn’s Poetry Procedure will definitely generate something, but we might call the result a nonsense poem. As you know, a Haiku is a 17-syllable verse form consisting of three metrical units of 5, 7, and 5 syllables. I might add instructions to Glenn’s Poetry Procedure to fit the words I find into a haiku. Or I might add some other instruction that lets you arrange or parse the words in some other way. Or not. 1. Take 2 steps forward. 2. Take 1 step to the side. Your choice of Right or Left. 3. Close your eyes and turn in a circle as you count to 3. Then open your eyes and go back to Step 1. 4. If during any step you bump into another person, give them a hug, then turn 180°, then go back to Step 1. 5. If during any step you bump into a wall, go to Step 6. Since different people will count to 3 at different rates, and turn at different rates, Step 3 contains a sort of “randomness” generator or “individual variable.” It might be that watching a single person perform Glenn’s Dance Procedure is not too interesting, but that watching 20 people in a large courtyard perform it starts to become more interesting. 1. Get a piece of paper and a red marker. 2. Hold the marker in one hand, and feel your pulse at your carotid artery with your other hand. 3. For each beat of your heart, make one small mark on your paper. 4. Repeat until your paper is filled with marks. Glenn’s Sound, Poetry, Dance & Drawing Procedures are quite minimal. I might want to think a bit more and add a few more rules to them. Or I might want to actually perform them a few times, see what happens, and then modify my rules in ways that I think will produce more “interesting” results. “Interesting” for me might be results that are aesthetically pleasing regardless of what rules it took to get them. Or I might care more about the nature of the rules than what the specific results are. Or I might care about both. 3. Create a blog post that includes the steps of your procedure, and documentation of your performance. Your documentation might be Text, Photo, Audio, or Video, depending on the nature of your procedure. 4. Write a paragraph explaining what you were going for in writing your procedure. 5. Write a paragraph analyzing the results you got. 7. Is it earlier than 11:59pm on Sunday night? If yes, go to step 8. If no, send Glenn an email asking him to look at your late work. Whirls and Twirls was created for the Iris B. Gerald Cantor Roof Garden at the Metropolitan Museum of Art in New York. 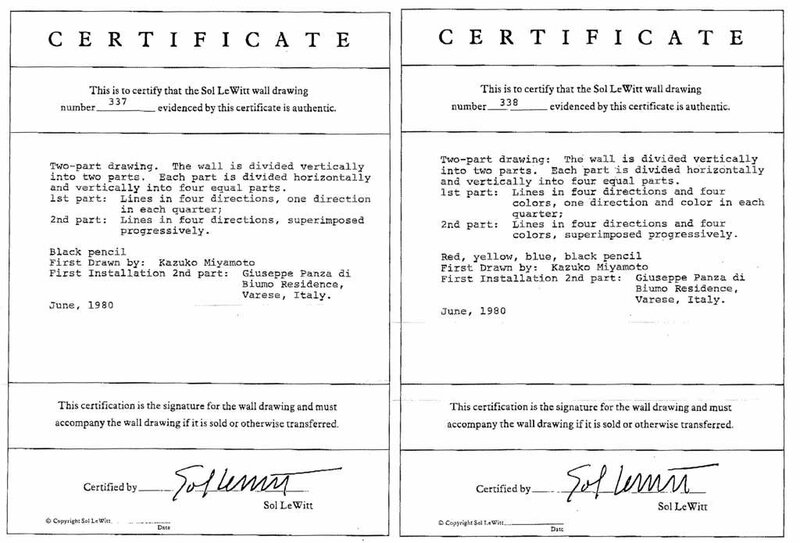 Sol LeWitt designed the wall drawing to accompany a series of abstract three-dimensional forms called Splotches. The artist saw the curvilinear forms of both the structures and the drawings as complements to the undulating landscape of nearby Central Park, while the vivid colors provided a bold contrast with the gray tones of Manhattan’s skyline in the distance. 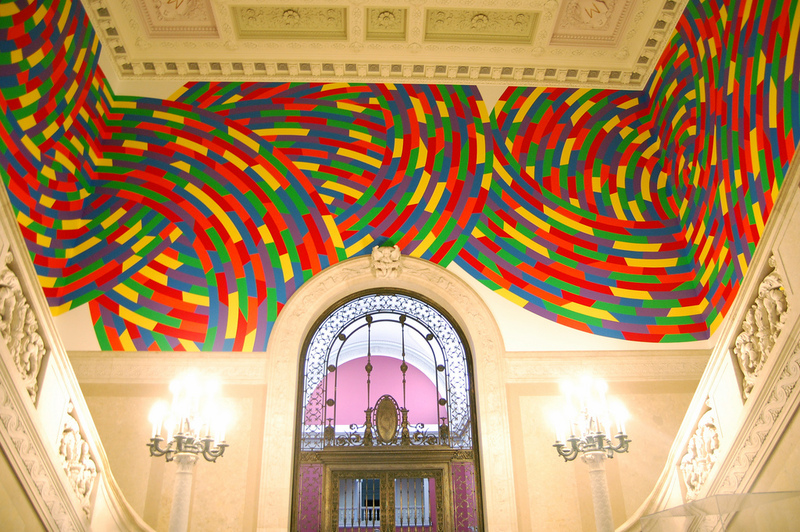 This wall drawing is based on Wall Drawing 1131, executed the previous year and also subtitled Whirls and Twirls, which LeWitt created for the Wadsworth Atheneum in Hartford. The curving arches and brilliantly colored bands add an overwhelming vitality to the 1800-square feet of wall space surrounding a Beaux-Arts style marble staircase. Sol LeWitt Wall Drawing #797 from Mary Roland Myers on Vimeo. Wall Drawing #797 represents a return to the linear repetition that Sol LeWitt explored in his wall drawings of the late 1960s and ‘70s. The instructions for the drawing direct draftsmen to copy, without touching, the line made by the previous draftsman. The repeated process becomes an exploration of the intricacies of the line. Peter Beyls, 1988, Ghent, Belgium. 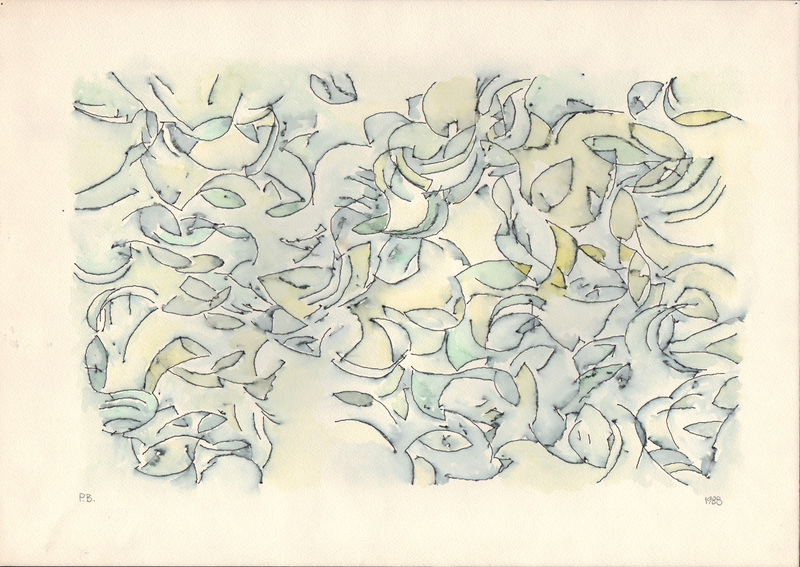 Untitled algorithmic pen plotter drawing tinted with watercolor. 11.5″ by 16.5″. Artist’s own software. Hardware: Symbolics 3600 & HP plotter. Collection of Roman & Alice Verostko. A Northern Spark White Night Event. Video projection at the Minneapolis College of Art and Design, June 4-5, 2011, all-night projection performance. 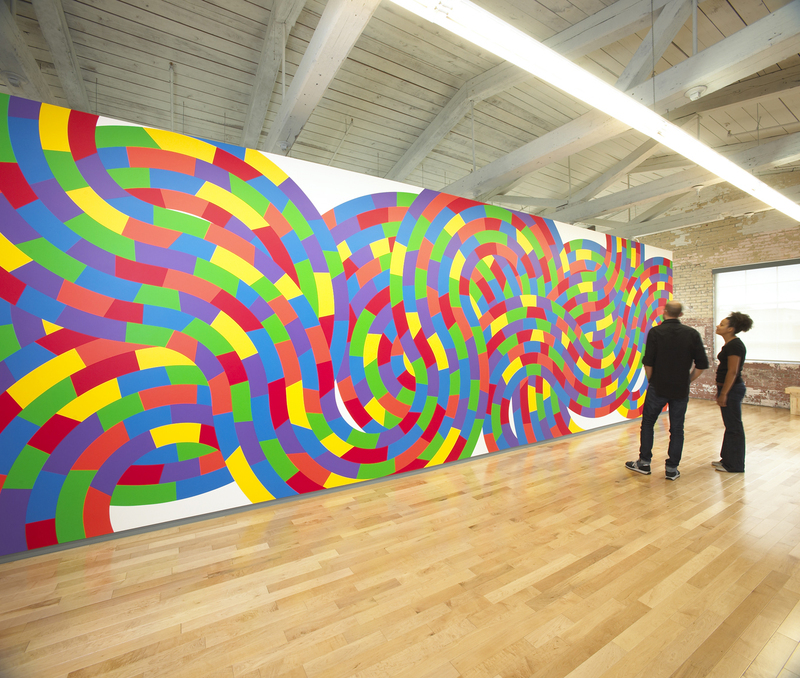 Sol LeWitt: A Wall Drawing Retrospective. MASS MoCA. Views of the installation in progress. 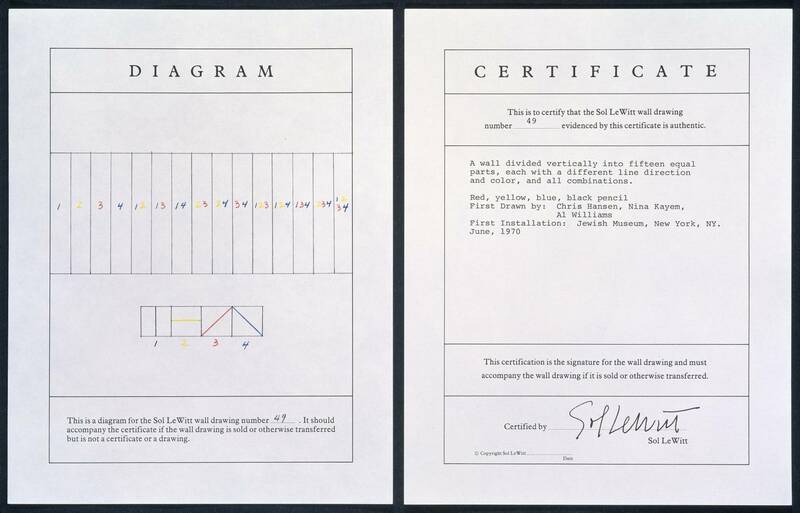 Regarded as a founder of Conceptual Art, Sol Lewitt devised guidelines and diagrams that allowed for artworks, such as his wall drawings, to be executed by his assistants. This has led rise to the myth that the artist didn’t do work himself, when in fact he worked prolifically – in one summer alone painting more than 260 gouaches and often working seven days a week. Here we learn not just how Lewitt worked, but about the kind of man he was, as remembered by his former assistant Jeremy Ziemman and the curator of the Sol Lewitt Collection, Janet Passehl. Flash Mob performed by Banda Simfònica d’Algemesí on February 23rd 2013 at Algemesí city (Spain), playing Ravel’s Bolero. Led Zeppelin, Stairway to Heaven, from the concert film The Song Remains the Same, Madison Square Garden, New York City. SkyJack is a drone engineered to autonomously seek out, hack, and wirelessly take over other drones within wifi distance, creating an army of zombie drones under your control. By Samy Kamkar. In a robot lab at TEDGlobal, Raffaello D’Andrea demos his flying quadcopters: robots that think like athletes, solving physical problems with algorithms that help them learn. In a series of demos D’Andrea show drones that play catch, balance and make decisions together — and watch out for an I-want-this-now demo of Kinect-controlled quads. Hey Glenn, I’ve just finished up a alpha demo of a game I’ve been working on. Its a short little puzzle game that limits itself to one dimensional movement, and the general consensus among play testers is that its pretty fun, yet a trippy experience. Could I use this as my algorithmic art? Great Kyle! As you and I discussed in class on Thursday, yes! It’d be great if you can upload the .exe for your file someplace and link to it on your website. You could also share the link here! Hey Glenn, I’ve uploaded my Week 12 Activity today. I was hoping you could still take a look at it. Thank you! Hi Glenn! I’ve finished my Week 12 classmate and artist interview. It would be great if you took a quick look at it. Thank you! Hey Glenn! I turned in my week 12 classmate and artist interview more than a week ago, and I still haven’t gotten credit for it. It’d be great if you would take a look at it. Thank you! Sorry to bother you again, but I posted my week 12 classmate and artist interview a couple weeks ago and I still haven’t received a grade for it. Please let me know if you have any questions! Points for Wk 12 updated.